Get the flooring you’ve always dreamed of by shopping at our local flooring store! We offer one of the area’s largest selections of high-end floors at prices you can afford. Featuring a number of attractive materials, styles, and products, you can count on us to help you select the option that satisfies in all respects. For the perfect balance between function and beauty, as well as affordability, you can’t go wrong with laminate flooring. 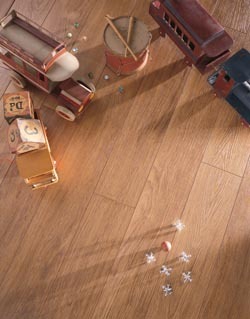 Whether you need new floors for a single space or the entire house, laminate is sure to satisfy. Designed to mimic the appearance and texture of traditional flooring materials, the latest laminate floor products deliver the look you want for less. The knowledgeable associates we employ are prepared to assist you throughout the shopping process. With so many attractive laminate styles to choose from, making a selection can be a challenge. We take the time to understand what you are looking for in regards to style and price. Laminate Tile Flooring – Laminate tile boasts the same kind of shape as luxury vinyl tile. It reflects the look and feel of other tile materials, including ceramic, porcelain, travertine, waterproof flooring, and natural stone. The laminate so closely resembles regular tile that only you will know it’s not the real deal. Laminate Wood Flooring – Laminate wood replicates the size and shape of classic hardwood. Featuring custom grains, textures, and variations, it is a cost-effective alternative to your favorite wood species. We continue to provide our clients with exceptional service even after they make a purchase. To ensure you are 100% satisfied with your investment, we are proud to perform laminate flooring installation on your behalf. Our installation services are conducted by a team of experienced technicians who are specifically trained in the placement of laminate. Utilizing the highest-quality tools and techniques, we provide comprehensive installation in a timely manner. Every completed installation is backed by a unique guarantee that doesn’t disappoint. Should you be unhappy with any aspect of your new flooring, you can take advantage of the guarantee and we’ll replace the floors with a comparable product free of charge. Get the perfect laminate flooring for any room in the home at our reputable store. Stop by our store or call today to learn more about the styles and brands available. Ask about our 12-18 month financing options. We proudly serve the needs of customers in Santa Barbara, Isla Vista, Mission Canyon, Montecito, and Summerland, California, as well as the surrounding areas.